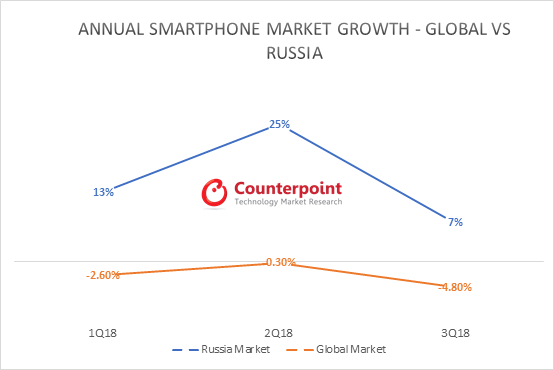 The Russian smartphone market has seen consistent YoY growth over the past few quarters despite a decline in the global smartphone market. This has made it a key country for smartphone OEMs looking to growing in Central and Eastern Europe in CY 2019 and beyond. Samsung, Huawei and Apple are the three major players, followed by Bright and Quick, Xiaomi, Nokia HMD, etc. The Russian audience is spending on new features and has enough disposable income to buy smartphones. Despite an emerging smartphone market, there are different variables that are going to be the deciding factor for trade in the Russian market and players should undertake a thorough PESTEL (Political, Economic, Social, Technological, Environmental and Legal) analysis before making any move. Increasing Competition: Growth numbers have made the market look attractive and many global players have already announced Russia as a major focus. Chinese smartphone players like Huawei, Xiaomi, Bright and Quick have been continuously focussing on the market and initial expansion has been aggressive. Vingroup, Vietnam’s top company by market value has specifically mentioned Russia as the market it wants to target. Recently, Vingroup has acquired 51% stake in BQ (Spanish smartphone maker) and plans to enter Russia with this partnership. Yandex is the largest search engine in Russia with penetration of more than 55% in the Russian search engine space. It also has its own app for payment, music, maps, taxi and food. Yandex recently unveiled its new smartphone and this is poised to disrupt the smartphone market ecosystem in Russia, giving direct competition to major players. Yandex has been aggressive in marketing and advertising of its phone and, according to its product page, more than 80,000 people have expressed interest in the device in just the last two months. It is expected to be among the top 10 best-selling models in CY 2019, provided Yandex is successful in scaling production. App Market Trends: The Russian app market is the fifth largest in the world and is still growing quickly. Analysing the app market and understanding market trends is a productive way for OEMs to design smartphones that align with local users’ needs and usage. Gaming phones: Russia’s gaming market is huge and smartphone players launching phones to tap into this market are expected in 2019. Out of the total apps downloaded from the app market, more than 45% were games and a major driver for app markets’ revenue. In Europe, Russia was ranked no. 1 in the number of games downloaded through apps. Asus has already launched its ROG Phone in Russia and it is expected that other smartphone players will seek to cash-in on this opportunity. Spending behaviour: Russian smartphone market has seen a change in spending behaviour in smartphones. Price band $30-90 which was the top selling price band in 2Q17 saw a YoY decline of around 8%. 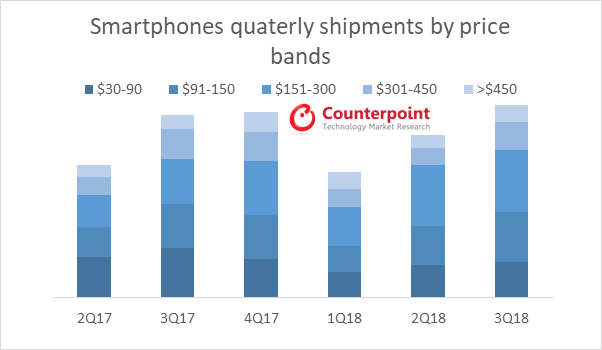 Price band $90-150 is attracting more buyers with a YoY growth of around 9% since 3Q2018 and is expected to be the top choice for Russians in the coming months. US Russia Relations: Recently, a chain of events (for example, escalations in the Ukraine conflict) occurred that did not favour US, Russia relations. If the relationships between the two nations are further compromised, US brands such as Apple may come under increased pressure. Blockchain friendly phones: Russian programmers have a significant presence in crypto currencies and Moscow ranks no. 1 in the number of Initial Coin Offering projects based on the location of their CEOs. Blockchain has proved to be major income source for around 15% of the Blockchain users and this penetration is likely to increase. 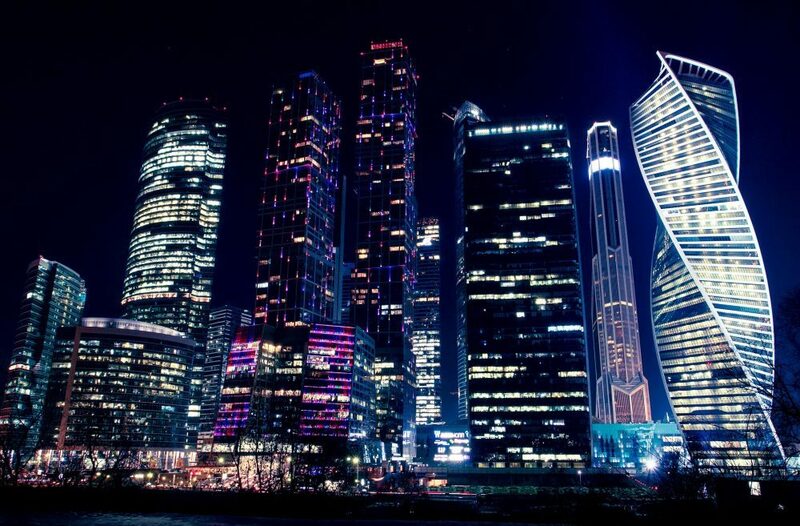 Blockchain has made an impact in Russia and is now finding new applications over a diverse set of business fields in Russia. This presents a potential opportunity for smartphone players to offer blockchain supporting products such as the HTC Exodus 1. 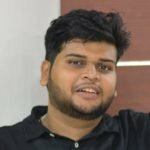 Abhilash is a Research Analyst who tracks mobile devices and ecosystem. He started his career as an analyst at India Internet Fund where he studied early stage investment trends and did sector analysis. He holds a Masters of Business Administration from IM, BHU and a Computer Science and Engineering degree from IT, GGV.